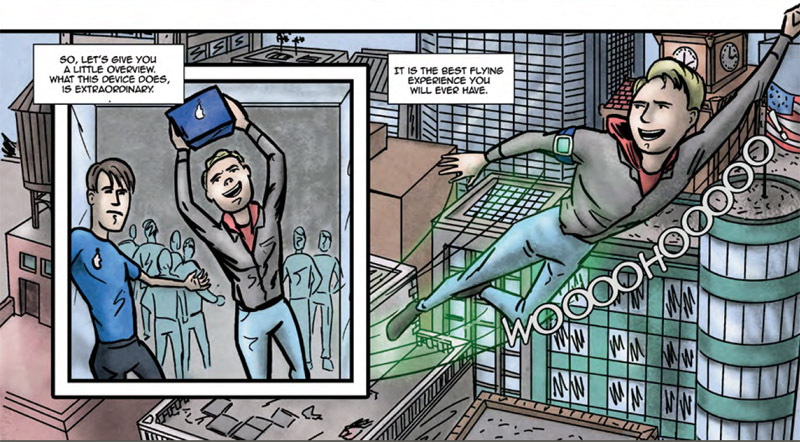 “iHero” is a comic book that mixes satire and whimsical use of superhero tropes to provide some good laughs in its debut issue. I think what I like most about this work is that it’s not afraid to just goof around. There is plenty of silly humor run amok. There is more going on too but it’s the offbeat humor that I’m favoring the most. We begin with Pear Industries introducing their latest must-have product. The charismatic company chief, Jack Taylor, has just launched the iHero. People have been queuing for days just for a chance to be one of the first to own one. But this is far more than just the latest way to organize your music and cat gifs. With the iHero you are transformed into your very own superhero. If you’ve always wanted to fly, then this is the gizmo to do it with. But what if you’ve always wanted to rob a bank? Well, this is also the gizmo to do it with. It’s a pretty funny premise. 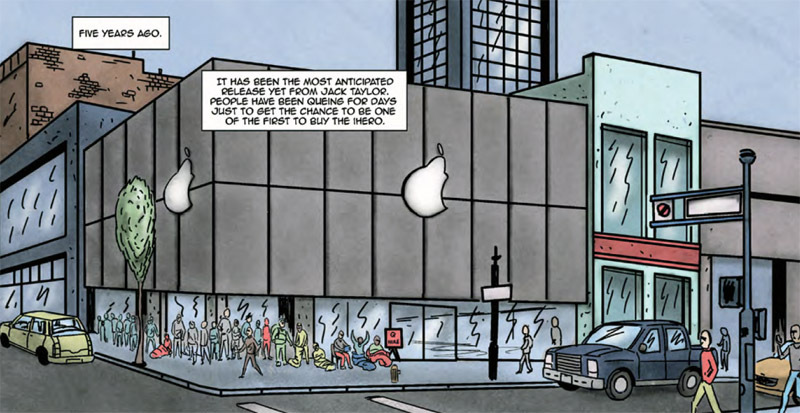 Luke J. Halsall’s story works quite well with Graeme Kennedy’s artwork. They both want to riff on the absurdity they see in life and they do this well with a light-hearted approach. I think when the story makes a shift away from the funny stuff and has characters engaging in traditional superhero action that things tend to drag a bit. I wouldn’t worry about it too much one way or another. I think the talent behind this comic is in it for the long term and will find a way to make it all come together. Maybe things will get even stranger. I’m all for that. “iHero” is a production of Obscure Reference Comics. Visit OR Comics here. Yeah, very cool comic, Luke. Thank you for stopping by.